Over seven in ten women have admitted to fantasizing about a man in uniform (according to Female First), and Delilah Devlin has the perfect collection for all of them! The masculine, authoritative men in High-Octane Heroes are primed to take on any challenge and enter danger zones in the name of honor, duty, country, and even love. 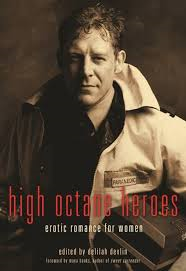 Delilah’s just-published High Octane Heroes has been claiming rave reviews from trade and consumer publications alike. Fans of alpha heroes can follow along on a virtual book tour at the official High Octane Heroes site; the tour includes giveaways and exclusive interviews and excerpts. With romance as the fastest-growing genre in literature, Delilah is sure to delight readers with her latest compilation.